If you are interested in sealing your new brick pavers, Moderna can determine how soon your new Jacksonville paver installation project will be ready for sealer. This will depend on a few characteristics of the new pavers; the porosity- or the total volume of the pores and how much water will be absorbed, the amount of efflorescence visible on the surface- this will vary depending on how recent the bricks were manufactured as well as other factors such as humidity. First, the pavers are treated for stains if necessary. Then if necessary we clean them with specialized paver efflorescence cleaner to remove any ground in dirt or chalky white salt deposits that may be present. We reccommend using sealers that are non-hazardous, environmentally safe, and have mold and mildew inhibitors built in for added protection of you new brick pavers. As with all pavements, sometimes maintenance is necessary. Moderna offers the following maintenance and care recommendations for your new pavement. During the course of normal use, the sand-filled joints may receive dirt from traffic on the pavement. Dirt settles into the top of the joints, helping to hold the sand in place. Installations exposed to driving winds or runoff, however, may lose some joint sand. Sealers are not necessary but will help hold the sand in the joints, and repel stains. These are applied over the entire paver surface as a liquid and allowed to soak and cure in the joints. Besides stabilizing the joint sand, sealers can prevent seeds from germinating, and prevent ants from entering joints. In a full restoration service we will carefully pressure wash all pavers and joints removing existing joint sand. The joints will then be refilled with a fine grade joint sand, and finally the entire surface sealed with a top quality sealer. Your new pavers will need periodic cleaning to keep them looking their best. Generally a regular sweep with a stiff broom or power blower will be adequate to avoid any build up of dirt. However, you may wish to clean your paver patio, walk, or drive annually with a pressure washer or mild cleaner. A medium pressure washing will not disturb the joint sand but a firm 20 degree or smaller head may require topping up the joints with clean, washed, fine sand- you can buy this by the bag at home depot or lowes. Concrete pavers can be removed for access to underground utilities, and reinstated after repairs. 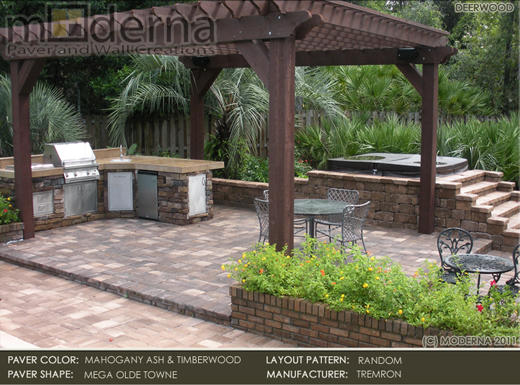 Moderna can reinstall paver sections of almost any size to the same look prior to the repair using the same pavers. Concrete pavers on driveways stained by oil leaking from cars aren’t damaged by petroleum products, but the stains can be difficult to remove. Stains should be treated as soon as possible since the longer they remain on the surface, the deeper they penetrate and the harder they are to remove. Wipe excess oil from the surface as soon as possible and apply liquid detergent. Allow it to soak for several minutes. Then wash the pavers with hot water. Several treatments may be necessary for particularly stubborn stains. If stains are still present, we will apply sleaners specially made for removing oil stains from concrete pavers. In some cases, it may be simpler to replace the stained pavers with new ones.